The almost true-black flowers of this new variety are a stunning sight, particularly when they are just beginning to open. 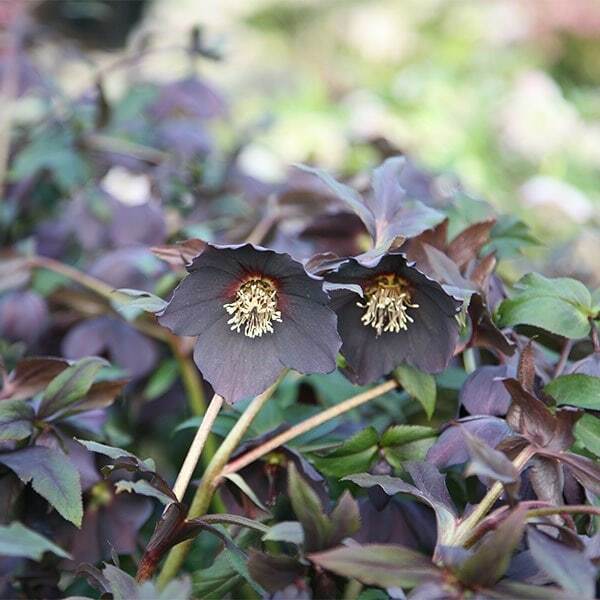 They are mostly outward facing (all the better for seeing them), although some may be more pendent, but they all have an alluring sumptuous velvet-like appearance, which is picked up by the purple-flushed, deep green foliage. Flowering in late winter and early spring they will add interest to shady borders, woodland gardens or patio pots. To create an interesting contrast, plant with snowdrops and/or creamy white flowering daffodils. I am a hellebore lover and looking forward to seeing my plant in full flower. I bought this beautiful Hellebore last year to join the other 2 variety I have on my border, and this year the first flowers came out, they are charcoal black just like in the picture. I love how Hellebores thrive on the winter.